Powered by 6- and 8-cylinder engines coupled to the trademark BMW rear-wheel drive, the handsomely styled 5-series offers a blend of dynamics and comfort unrivalled in its class. The BMW 5-Series sedans are the benchmarks other companies use for their luxury sports sedans. They are true sports sedans, offering superb handling and responsive engines. In addition to the sedans, the 5-Series offers sport wagons that are fantastic. They offer much better handling than any sport-utility vehicle and better performance than most sedans. 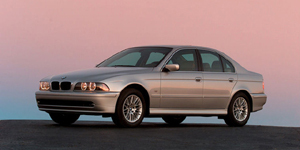 The 2002 BMW 5-Series Sedan is powered by a base 2.5-liter Inline-6 with 184 hp. Other available engines include a 3.0-liter Inline-6 with 225 hp and a 4.4-liter V8 with 290 hp. The 2002 BMW 5-Series Wagon is powered by a base 2.5-liter Inline-6 with 184 hp. Also available is a 4.4-liter V8 with 290 hp. Find the used BMW 5-Series of your choice from a dealer in your area. Search our used car listings now.